Chickenpox is caused by the varicella-zoster virus, a member of the herpesvirus family. It is an issue that is hotly debated among all medical doctrine camps. Vaccinate or don’t? Expose your child to them or hide them from it? Give them medications or don’t? ~1 It is dangerous. Period. Consider these facts, taken directly from the National Vaccination Information Center(NVIC): Please be aware that this is not a web site that promotes natural remedies. It is simply an informational site that is relatively unbiased in either direction. Somethin’ just ain’t addin’ up, my friends! Even more frightening to me is that this report only contains the reactions from ONE form of the vaccine. In all fairness, if you check out the MERCK site, they give a much better representation of the statistics. individuals agreed to remain in the blinded study (n=163 vaccine, n=161 placebo), 96% protective efficacy was calculated for the vaccine group as compared to placebo. So, here is my questions…….Why did over 600 of the original participants drop out of the study (see bold, italicized statement in the above quote), especially if it was so effective? You do realize that those study participants get paid, right? Nearly 75% of the original participants declined the money and the miraculous 100% protection for their child because…….? ~3 Children need to be exposed to the virus to build a natural immunity to it. There are numerous studies that have shown the vaccine may work to help the cases of chicken pox, but it leads to the development of shingles in older individuals, which is a far more dangerous disease. Okay, now that I’ve gotten that out of my system we can move on. Let’s just say that, despite all of your best efforts your child gets chicken pox. What are you gonna do? First of all, you are going to make sure that everyone’s immune system is strong. I, of course, would highly recommend the Tamara’s Herbes line of herbal supplements for healthy immune systems. It contains herbs that have been used for centuries to help build and maintain strong immune system function. Herbs like astragalus, alfalfa, golden seal, ginseng, st johns wort and echinacea. Failing that, eat lots of fresh fruits and veggies, drink plenty of water, get exercise and sunshine on a regular basis, practice safe hygiene habits. Then, you need to set about making the child as comfy as possible. Loose, light natural fabrics will help reduce irritation of the bumps and allow the skin to breath. Soothing baths. Cool or lukewarm baths with soothing herbs like lavender, oatmeal, cucumbers, calendula and chickweed are some of the better ones. ~For a soothing bath, mix equal parts of any or all of the dried herbs in a small teabag or tie up in a piece of muslin or cotton and let float in bath. Don’t throw away the teabag after the bath! Instead, toss it in a 1 qt jar of distilled water mixed with 2 TBSP apple cider vinegar. Use the teabag as a sponge to dab at the rash between baths. This will not only sooth the itch and pain, but it will cool the skin and help prevent infection. ~And yes, I realize you can’t find dried cucumbers. I actually meant fresh ones. Just slice one up and toss the pieces in the bath, peel and all. The fever, while frightening, is actually a good thing. I know the common school of thought is that we want to bring a fever down, but natural medicine dictates otherwise in most circumstances. The fever is simply evidence that the body is working exactly the way it is supposed to. The heat generated by the body kills the invading bacteria and causes the body to perspire, thereby pushing out the dead, toxic waste through the skin. This is a completely natural, healthy response. Cool baths, or cool packs placed at the throat, the back of the neck, the wrists, the forehead and the feet are effective and provide comfort. Herbal salves are very effective at helping to heal, sooth and help prevent infection from scabs that have burst or been scratched open. The same herbs that make a soothing bath also make a soothing salve. Herbs like comfrey, burdock, nettle, mullein and sage will help minimize the itching and pain. Give them lots of water. This will help prevent dehydration, and it will also help the body flush the nasty virus from their system. Fruit juice is an excellent addition, but only if it is free of HFCS, sugar and artificial sweeteners, which are likely to make the itching worse and prolong the symptoms. Most of all, be patient. This is one of those things that just needs to run its course. Overall, this is really not a dangerous disease. Yes, there are exceptions and every parent should closely watch their child for unusual signs or symptoms, especially if other known medical conditions exist. Otherwise, roll with it. Try to keep them from scratching as much as possible. Oh, and take lots of pictures!!! They are so good to pull out when you meet prospective girlfriends/boyfriends. My kids totally love it when I do things like that! That definition was for those of you who don’t suffer from insomnia. Those of us who do already know what it means, and we know that the definition, no matter the source, can never actually explain the entire scope of this affliction. Let me give it a shot, though. Insomnia is an affliction that, when you lay down and close your eyes because you are so exhausted you can’t possibly do anything else, your mind springs to life and causes your eyelids to fly open and stick that way, despite all of your best attempts at closing them. It makes your legs twitch and your brain spasm with a million thoughts. It inspires you to create great and fantastic things-just as soon as your exhausted body can move again. It precipitates deep and poetic thoughts that should be preserved in leather-covered tomes – if only you weren’t too tired to write them down. It tickles the imagination into seeing shapes in the dark, like pictures in the clouds, that you know are really only figments of your sleep-deprived brain. It makes you count sheep, cattle, chickens, ducks, and every other animal in a vain attempt to bore yourself into a sleep-induced coma. Then, when you have finally attained that much-longed-for state of unconsciousness you are suddenly jolted from sleep after an hour -or maybe two or three- to find that you are still hours away from the break of day and everyone for miles around is still sleeping soundly. It is lying there staring at the clock, counting away the minutes and knowing that the exhaustion is still there, just waiting to overtake you as soon as you have reached the point in your day that is the busiest/most important. By lunchtime, you aren’t quite sure if you want to jump in front oncoming traffic or choke the nearest passerby. Not because they have done anything wrong, but simply because you know that they got a good night’s sleep that was denied you. For that, they deserve a good beating. And that’s only one night’s worth of missed sleep. The second night gets a little hairier. By the third or fourth night you begin to see the logic behind men like Dexter and Dahmer. Rational thinking is only a dim memory ~ an elusive dream (pun intended). Do I sound like a commercial for the latest sleeping pill? I should totally get paid for writing this stuff, right? Still, anyone suffering from insomnia knows exactly what I’m talking about. Unfortunately, it isn’t as simple as popping a pill and drifting off to Dreamland. Besides the obvious side-effects of sleeping pills ~ liver damage, heart damage, kidney failure, ulcers ~ there is the small matter of being able to function the day after. Sleeping pills, if they even work, make you so frackin’ tired the next day that you might as well have just stuck with your original state of sleep-deprived exhaustion. Quit snickering. Have you tried them? I don’t mean have you tried a single cup of chamomile tea before bed. While chamomile has its benefits, to the hard-core insomniac it is like drinking a cup of water. No, what I’m talking about are the other herbs. You thought I was talking about marijuana, didn’t you? While I will admit that I would recommend that particular herb if I lived in the appropriate state, that’s not what I meant. I’m talking about herbs like valerian and skullcap. St. John’s wort. Peppermint. Vervain. Mullein. These, my friend, are the magic pill for the true Insomniac. I’ll be honest. It took me a while to figure this one out. I did try sleeping pills over the years. Prescription. Over the counter. Under the counter. Beside the counter. I didn’t care if there was a chance that I might get a few hours of uninterrupted sleep. Not one of them was worth it. It was out of sheer desperation that I put my insomnia to use and spent a few nights coming up with a more natural formula that I prayed would work. Now, I keep a jar in my pantry and refill it regularly. Bonus…it works as a pain-killer, muscle relaxant, tummy-soother and mood-stabilizer, also. Let me explain the how’s and why’s. Valerian is the bad-boy of sleep aids. I still maintain that herbs work best when combined with other herbs, but if I were ever to use one by itself, this would probably be it. It is in the top 5, anyway. 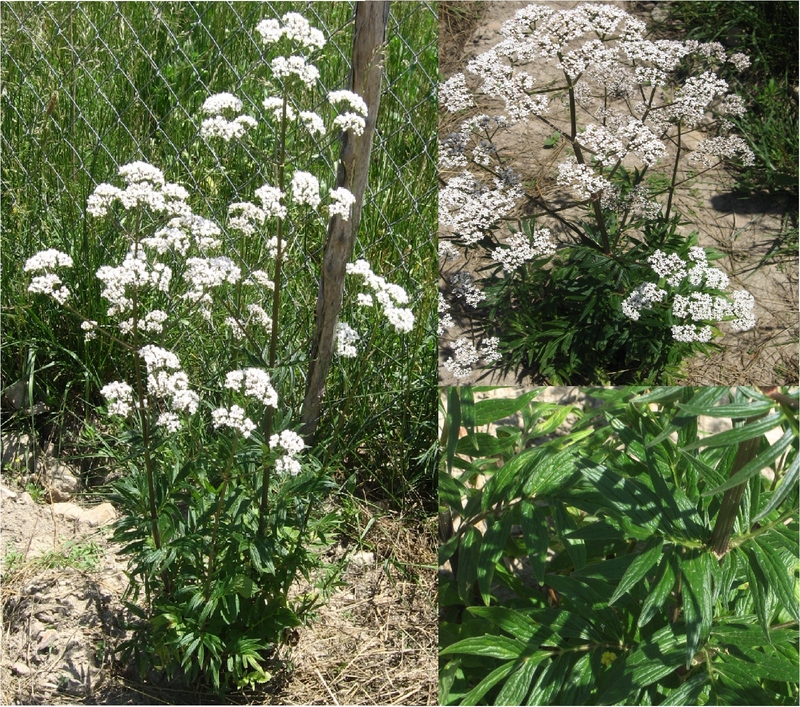 Valerian is actually classified as a nerve tonic because it has the ability to both sooth and heal the nerves. By soothing the nerves, you allow your body to fall into sleep naturally, stay asleep longer and wake up feeling great. Valerian goes a step farther, though. It will actually help rebuild nerve sheaths that have been damaged, making it a great herb for long-term use in diseases that affect the central nervous system and the nerves. Don’t think valerian is going to suddenly make you fall asleep, though. It doesn’t work that way. It works by relaxing the entire body and making it possible to sleep. That means that after you take it, you need to go lay down and close your eyes. Let your body do it’s thing! Skullcap, like valerian, is a potent nervine that has been used for centuries with fantastic results. It is so soothing to the nerves that it has even been used to successfully alleviate the symptoms of drug withdrawal, as well as epilepsy, hysteria, anxiety, nervous headaches and insomnia. Naturopathic doctors often recommend using skullcap as an alternative to conventional ADD medications, also. Skullcap should not be taken if you are pregnant, as it is capable of inducing a miscarriage. Mullein is one of those herbs that should be in every medicine cabinet. It is good for coughs, for pain, for soothing the nerves…the list is long! Mullein has been described as being ‘hypnotic’ and ‘highly narcotic without being toxic’. 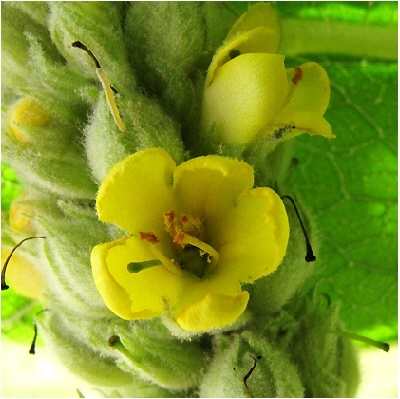 That means that, even if your sleeplessness is due to pain, mullein is capable of handling it. Cough keeping you awake? Mullein will take care of that, too. St. John’s wort is a well-known anti-depressant. In the herbal world, that means it is soothing to the brain. It relaxes you by relieving tension, stress and other factors that contribute to restlessness and fatigue. It is best to take this one over a period of time, and in conjunction with other herbs. It is also a highly effective pain-reliever and immune-system stimulator. Vervain is not just for warding oneself against vampires. It has aspirin-like effects that help relieve pain and reduce inflammation. It is a muscle relaxant and mild anti-depressant that helps improve the general action of nerves and enhances the entire system, especially when taken over a period of time. It is a mild sedative. Here’s the catch with this herb, though…you don’t want to just grab a bottle of this herb and start eating it. Vervain works best when it is combined with other herbs that strengthen and relax the nerves, and if you take too much you’ll soon be heaving your guts up instead of sleeping. Used in the proper manner it is a valuable addition to the insomniac’s medicine chest, but used wrong and it is worse than useless. So, really….put away the Ambien and the Tylenol PM. You don’t need them anymore! You just need a good, trained herbalist (like me) to whip you up a batch that contains these herbs. Of course, I have a batch already made and waiting called ‘Sweet Dreams’…I’m just sayin’…. There isn’t much I love about summertime in Missouri. Intense, breath-taking heat, high humidity, biting and stinging insects…discomfort is virtually assured from June through September. However, there are few a things that make all that discomfort worthwhile. 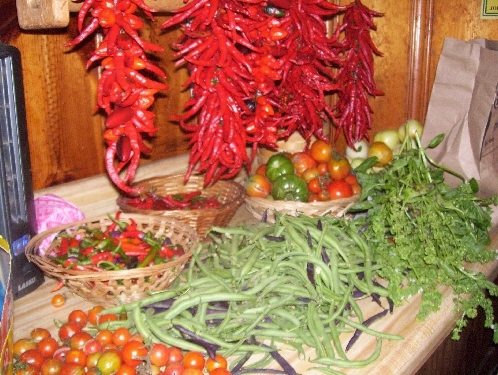 Long hours of daylight, spending time at the river and, most of all ~ fresh garden veggies. No summertime garden would be complete without Zucchini. Baked, fried, stuffed, pickled, raw ~ it doesn’t matter how you prepare it~ I love it! The last couple of years have solidified my favorite method of eating those big, fresh beautiful zucchini, though. It is definitely stuffed and baked. Which means that I have to share that wonderful recipe with you. 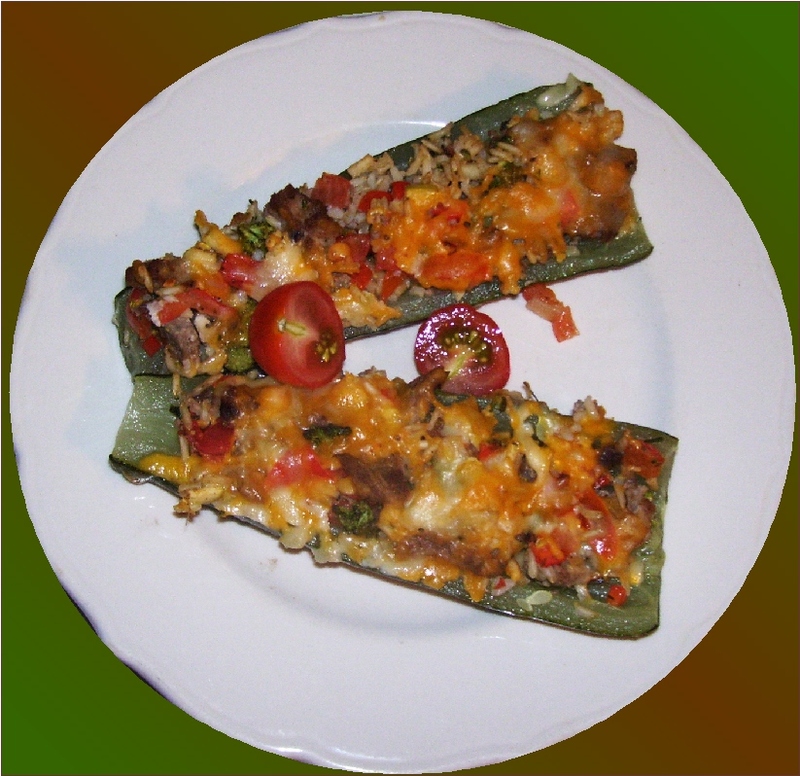 The beauty of stuffed zucchini is that it comes out tasting perfect weather you use fresh or frozen zucchini. I always like to take a few zucchini and stick them in the freezer for this garden-fresh treat during the cold months of winter. Zucchini is one of the few veggies that requires little or no processing before freezing. Simply cut into slices, shred or grate it, stick it in a freezer bag and pop it in the deep freeze. To freeze it for stuffing, cut off the ends, scoop out the seeds and voila! Admittedly, zucchini can get a little mushy after it thaws, but if you aren’t eating it raw it doesn’t really matter. Use the slices for fried zucchini, pizza topping or add them to a quiche or pasta sauce. Throw chunks in some chicken or beef broth to make a delicious winter soup. Use it grated in zucchini bread or, as I’m about to share, as stuffing. If you are looking for an exceptionally healthy veggie, this one nears the top of the list, providing you leave the skin on. Zucchini has a high water content, making it very low in calories, and contains no fat or cholesterol. It contains 7 g of carbohydrates, 56 percent of your daily recommended value of vitamin C, 11 percent of your daily value of vitamin K, 16 percent of riboflavin, 21 percent of vitamin B-6 and 14 percent of folate, plus vitamin A, vitamin E, thiamin, niacin, pantothenic acid, potassium, manganese, magnesium, phosphorus, copper, calcium, iron, sodium, zinc and selenium. 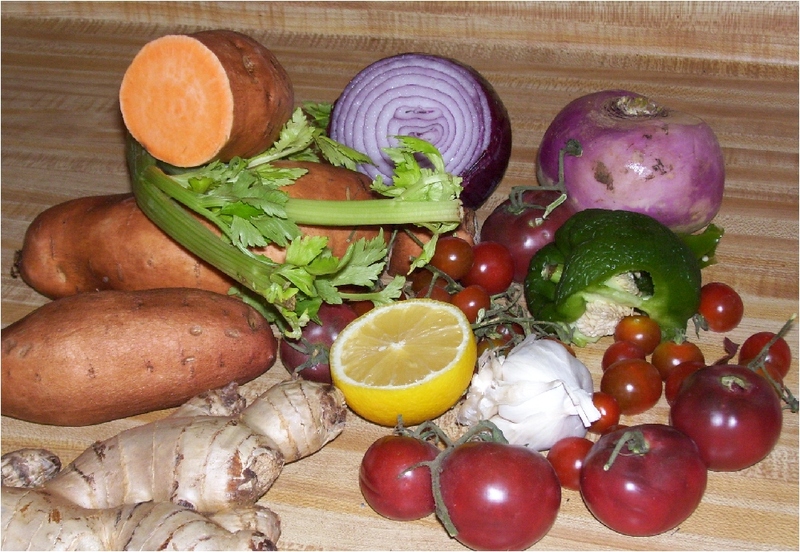 2-3 cups diced or grated raw veggies ~ tomatoes, squash, carrots, cabbage, peppers, celery… This is a great recipe for using up some of those veggies that have gone soft but aren’t bad yet. Like all my recipes, this one is adaptable. If you are using frozen zucchini, you can skip this first part and jump ahead to the stuffing part. If you are using fresh zucchini here’s what you do. Take the 3-4 large zucchini and fill a pot big enough to lay them in. Fill the pot with water and bring to a full boil, then place zucchini (with ends still intact) in pot. Boil for 7-9 minutes. Remove from pot and place in ice cold water for 2-3 minutes. Remove from water and slice off the ends of the zucchini, then cut the zucchini lengthwise down the middle. Gently scoop out the seeds, saving as much of the flesh as possible. 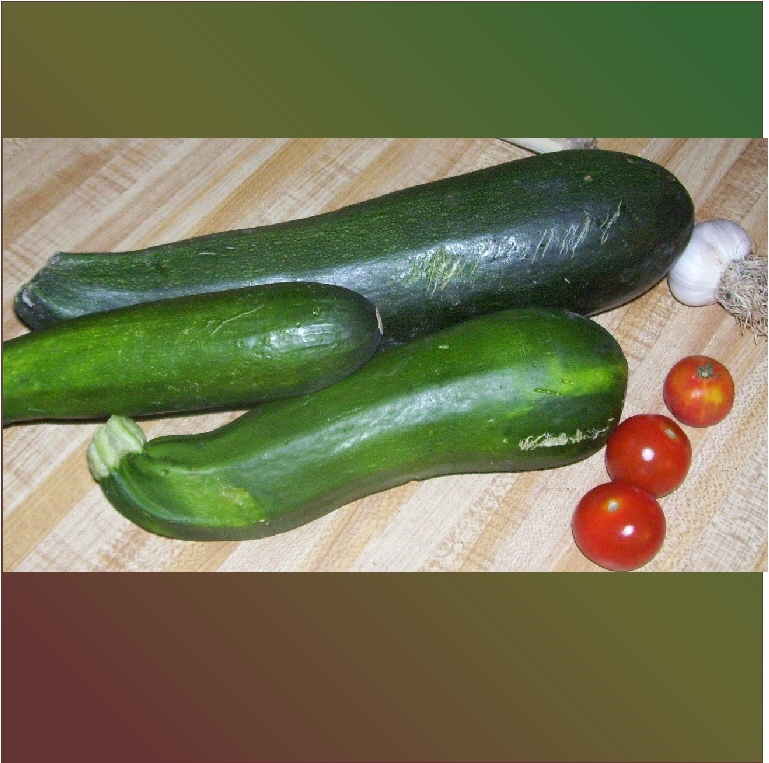 Place zucchini on a cookie sheet lightly coated with the cooking oil of your choice and sprinkle with sea salt. Mix all of your other veggies and the meat in a large bowl. Make sure you get the cream cheese mixed well enough that you don’t have large chunks in the blend. Add herbs and squeeze lemon juice over the mixture. Mix well. Fill zucchini with stuffing. Pile it on thick and high! Cook for 10-12 minutes. Remove from oven and sprinkle extra cheese across the top. Return to oven and cook until cheese is melted. Remove from oven and cool for 3-5 minutes. I feel it is only fair to warn you that this dish is VERY addictive! I grew extra zucchini this year so I could make sure I have enough to last me until next growing season. If you make more than you can eat at one sitting, you can throw the extra in the freezer and they reheat beautifully.